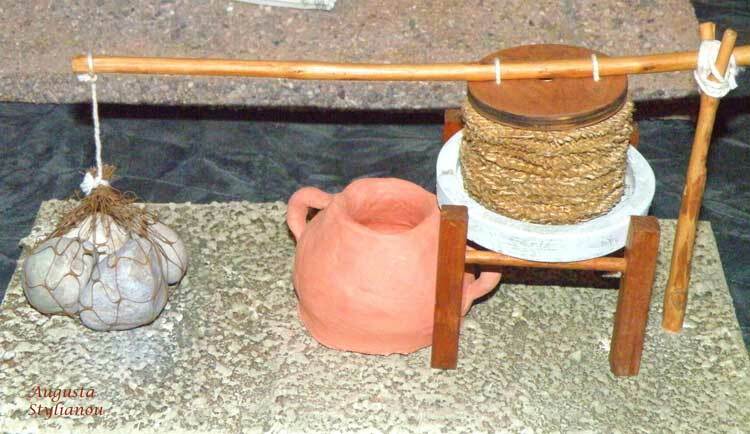 A representation of the oldest olive press of the "crowbar compression" type. Remain of this type of olive press were discovered on the island of Thirasia. It was described by Cato the Eldest while the unique depiction of it exists on a bas-relief of the 6th century BC, which is exhibited in the British Museum. The olive pulp, put in sacks was compressed by means of a lever and a counterbalance of stones.